There are so many reasons to own this four-string, short scale, hollowbody Hofner Ignition Violin electric bass guitar. Are you needing a bass to capture that elusive old-school thump?. Maybe you want the sound of an upright bass, but don't have the room on the gig for one. Excellent like-new condition. Includes leather strap. Get closer to the classic violin bass sound than ever before with this limited-edition, short-scale Hofner Ignition Violin Bass hollowbody bass guitar. Get signature Hofner bass tones with this limited-edition Hofner Ignition Violin Bass. These are from around 20 years ago -- a nice reissue of the rare Gibson EB-1 bass, the one that started the whole violin bass scene -- of course where Hofner got the idea for their well known holllow.body version. Rythmline Violin Bass - Used, Body Only. Condition is Used. Some cosmetic blemishes. See photos for details. No electronics included. Old Violin Sunburst. Series or parallel: Parallel. Neck joint: Bolt-on. Scale length: 34". Pickup switch: No. Tone switching: No. If you’re not satisfied, neither are we. It’s that simple. Taking a lead from our 70s Violin Bass models the Ignition Violin Bass guitars from Hofner let you get your hands on one of the world's iconic guitars. An iconic semi-hollow body electric bass that any serious bass player can afford. It may be one of the most affordable Hofner basses you'll find at Sweetwater, but the Contemporary Violin Bass is the real deal. A pair of Hofner Staple humbuckers split the difference between a woody acoustic tone and a warm and rounded sound. Get your hands on this Hofner Ignition LTD Violin Electric bass guitar with its ultra-lightweight hollow-body construction, slim 30-in. maple neck with rosewood fretboard, Adirondack spruce top and spruce body. 4 STRING BEATLE VIOLIN BASS GUITAR SUNBURST. NEW RIGHT HAND DEROSA VIOLIN BEATLE ELECTRIC BASS GUITAR. SCALE LENGTH, 29". Don't get the idea that this a just a "nowhere man" look-alike. The semi-hollow body and set neck will give you the warm, round tone you expect from the violin bass. New Gear: If you’re not satisfied, neither are we. Condition is Used. DVD Writer Input. 4GB Storage. 4-Cell 40 WHr Weight. Yes Battery. 2 x USB 2.0 1 x USB 3.0 Video Ports. No Bluetooth. 802.11N Ethernet LAN. This bass will give you the best quality sound and amazing aesthetics for a price that you will not believe. Scale length 30”. Neck Set Maple. A custom trapeze tailpiece, pearloid pickguard, and body binding on front and back are added touches. New Gear: If you’re not satisfied, neither are we. It’s that simple. Traditional 31" scale length. This particular model has been used very rarely over and is overall great condition. This bass sounds thick and creamy! Guitar is very clean for its age. I will do my best to work out any issues. Neck pickup switch on/off. Bridge pickup switch on/off. NEW LEFT HAND DEROSA VIOLIN BEATLE ELECTRIC BASS GUITAR SUNBURST. 4 STRING BEATLE VIOLIN BASS GUITAR SUNBURST. SCALE LENGTH, 29". Included: Brownsville New York Violin Bass Guitar - ONLY. The Brownville Violin Bass Guitar is in great working condition. No exceptions. Let us know what we can do to assist you further. Hofner IGNITION BASS Left Hand SB violin-based. Pickup Neck: Hofner Ignition Staple Nickel. Pickup Bridge: Hofner Ignition Staple Nickel. Wood Top: Spruce. is an excellent traditional style of violin based on cost performance. Bass is in excellent condition with only play wear scuffs to keep it from in mint condition. Bass has been upgraded to all German components. All those annoying "Made in China" stickers has been professionally removed. The Ignition Violin Bass guitars from Hofner let you get your hands on one of the world's iconic bass guitars. 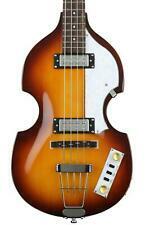 Hofner Ignition Beatle Bass. The electronics are checked for proper operation.Includes one set of Hofner Round Wound Strings. The Ignition Violin Bass guitars from Hofner let you get your hands on one of the world's iconic bass guitars. Small area of repair on face, lower bout bass side. Good condition showing minor scuffs and scratches. Epiphone introduces the Viola, one of the most recognized basses in the world. ~. check out the specs below! Historic Viola body style. Check this out. we have an. We stand by our products! Fingerboard dot inlays. The Hofner Ignition Beatle Bass is perfect for players looking for a Hofner Beatle bass but are not looking to shell out the big bucks for an original. Sheet Music. Recreating the style of the 1964 version. Featuring a sustain block inside the body to give modern, deep-resonating bass sounds while still retaining the original Hofner Beatles bass sound. With a short scale of 30" and the small violin bass body it is one of greatest electric bass guitars ever made. Way back in the 1960’s. NO EXCEPTIONS. Machine Heads: Open-gear w/ white button. Basswood body w/ Spruce Top. Body binding: ABS White. We will not declare any item for less than the actual sale price. Taking a lead from our 70s Violin Bass models the Ignition Violin Bass guitars from Hofner let you get your hands on one of the world's iconic guitars. Hofner Hi Series Ignition Violin Bass Guitar. Hofner® Dealer! The Hofner HI-BB-TBK is a black Ignition Violin Bass. Taking a lead from our 70s Violin Bass models the Ignition Violin Bass guitars from Hofner let you get your hands on one of the world's iconic guitars. Taking a lead from our 70s Violin Bass models the Ignition Violin Bass guitars from Hofner let you get your hands on one of the world's iconic guitars. Bridge Pickup: Hofner Ignition Staple Nickel. Neck Pickup: Hofner Ignition Staple Nickel. The warm bass tones of the British Invasion are here again! As historic as this bass may be, one of its most underrated features is the variety of different sounds it gives players. Johnson JJ-200 Viola Electric Bass Guitar. Savannah STB-700F Fretless Lightning Bass Guitar - Violin Sunburst, New! Savannah STB-700F Micro Fretless Bass - Violin Sunburst. Lightning Fretless Bass Guitar. Rich, deep bass tones are now practically in the palm of your hand, and convenient enough to take with you without carrying the doghouse or a full scale electric bass. 5 out of 5 stars - Savannah STB-700F Fretless Lightning Bass Guitar - Violin Sunburst, New! 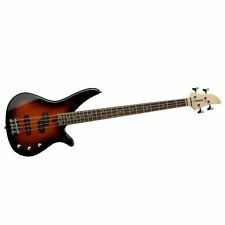 1 product rating1 product ratings - Savannah STB-700F Fretless Lightning Bass Guitar - Violin Sunburst, New! Yamaha TRBX174 Electric Bass Guitar - Old Violin Sunburst - QTY 1. Yamaha TRBX series 4-string electric bass guitar in old violin sunburst finish. This is an excellent learning tool for any beginning bass player. Taking a lead from our 70s Violin Bass models the Ignition Violin Bass guitars from Hofner let you get your hands on one of the world's iconic guitars. Bill's Music is an Authorized Hofner® Dealer. Neck Joint: Hofner Violin/Club Bass Set Neck. The Ibanez guiding philosophy for acoustics, "a modern approach to acoustic guitar tradition," extends quite naturally to their acoustic bass collection. With tone, style, playability at an incredible value, Ibanez acoustic basses are creatively inspiring tools designed to thrive in wide variety of musical situations. Yamaha TRBX174 Electric Bass Guitar - Old Violin Sunburst - QTY 1. Yamaha TRBX series 4-string electric bass guitar in old violin sunburst finish. This basic black strap is a great match for any acoustic guitar, electric guitar, or bass guitar. Neck finish: High Gloss. Neck Shape: U. If you’re not satisfied, neither are we. It’s that simple. Scale Length: 32" (82.8mm). Country of origin: China. Accessories: N/A. Special features: Balanced XLR amp /4" Outputs. Ibanez AEQ-SP2 preamp w/Onboard tuner. Black with white dot. Puerto Rico, Hawaii, U.S. Virgin Islands. 43mm at NUT. THIS INCLUDES CANADA! Balanced XLR & 1/4" outputs. Fishman® Sonicore. c : Max Depth. This guitar was made in Japan in the late 60's-early 70's but we are not sure of the exact year. These were among the first of the high quality imports from Japan. These basses are hard to find, especially in this condition. Rogue Vintage Sunburst Beatles Violin Bass Guitar VB100 Made in Korea New!!! New Electric Bass Guitar with Old Case. Item will be S&H via.